Providing you the best range of traditional designer printed sarees, digital designer printed sarees, chiffon designer printed sarees, abstract designer printed sarees, stylish designer printed sarees and glorious printed designer sarees with effective & timely delivery. We are offering our clients with printed Traditional Designer Printed Sarees. this range features perfect blend of color combinations and attractive motifs. We are offering our clients optimum quality Digital Designer Printed Sarees, which are highly appreciated by our customers. 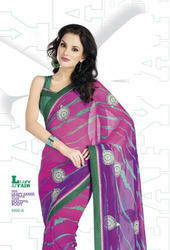 These Sarees are manufactured by fine quality material, which ensures its best quality. We are offering a premium quality Cotton Print Chiffon Designer Printed Sarees that enhance the looks when worn owing to their simple design, prints and patterns. We being one of the leading manufacturers and exporters of this Abstract Designer Printed Sarees, manufacture it using quality fabric. This product with its highly elegant texture and attractive patterns is quite asked for in the market. We are engaged in manufacturing, supplying and exporting wide array of Stylish Designer Printed Sarees. These are manufactured under the vigilance of our designers by using best quality fabric and advanced methods. We are specialized in supplying a designer collection of Resham Printed Glorious Printed Designer Sarees. Our sarees are available in various striking colors and attractive designs following the precise demands of clients. We are offering Designer Beautiful Color Printed Sarees. We have a wide range of Designer Printed Sarees with a different design and different color. We are engaged in offering an entire range of Floral Fusion Printed Embroidered Designer Printed Sarees. Our entire range of sarees is adorned with heavy & intricate embroidery work, which adds to its aesthetic appeal. Available in various designs & color combinations. It has a multi colored plain border which adds charm to the look of the Floral Fusion Printed Designer Sarees. Our collection boasts of creations of best Indian designers and also regular Indian women’s clothing. Get gorgeous ethnic clothes and dress up just the way Indian women dress. We are prominent manufacturer and suppliers of Bollywood Beautiful Crepe Printed Saree. Our cost effective and aesthetic range of Partywear sarees are popular among our countless customers. Apart from exclusive designs, the dazzling colors of these sarees are highly appraised by our customers. 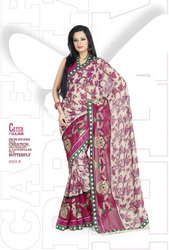 We are one of the leading exporters of Printed Soft Designer Sarees. This range is is crafted using supreme class fabric and technically advanced tools under the guidance of skilled designers to meet the international standards. Digital Printed Designer Sarees. We are one of the leading manufacturers, supplier, and exporter of a wide range of Designer Print Sarees in different colors and patterns to our customers. We are engaged in offering our clients, a complete collection of festival range printed sarees. The gorgeous attire is available in different fabrics like georgette, cotton and crape that make it an apt outfit for formal as well as traditional occasions. To fulfill the various demands of our clients, we are engaged in offering a wide assortment of Party Wear Beautiful Sparkling Sizzling Designer Printed Sarees. Our offered sarees are fabricated using superior quality fabric that is procured from the reliable vendors of the market. Our offered sarees are widely appreciated for their captivating designs, shrink resistance and stylish looks. Looking for “Printed and Designer Sarees”?